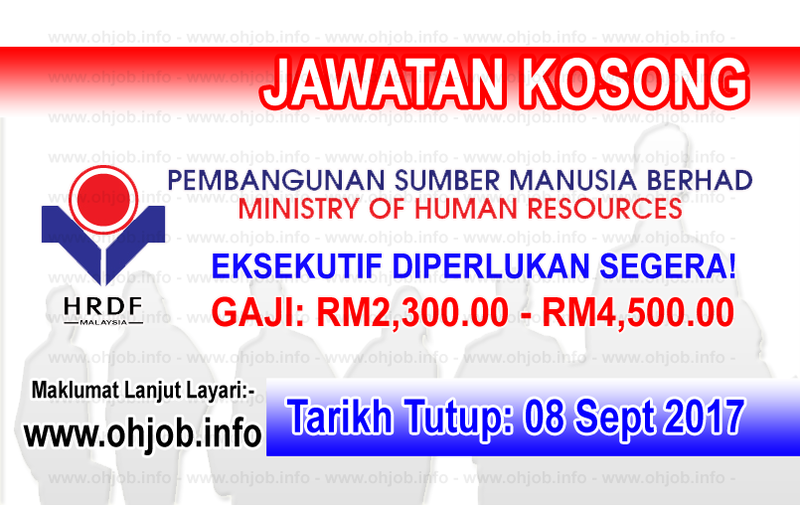 The Human Resources Development Fund (HRDF) is administered by Pembangunan Sumber Manusia Berhad (PSMB), an Agency under the Ministry of Human Resources, via the Pembangunan Sumber Manusia Berhad Act, 2001. In fulfilling the nation's aspiration to attain the status of developed country by the year 2020, the HRDF was established in 1993 with the aim of developing quality human capital and world-class workforce in order to achieve a high income economy based on knowledge and innovation. Terima Kasih Kerana Membaca Dan Menyemak Jawatan Kosong Pembangunan Sumber Manusia Berhad - HRDF (08 September 2017) Selamat Memohon Dan Semoga Berjaya Kami Ucapkan, Sila LIKE Facebook Page Kami Dan Kongsikan Kepada Semua.